It's day four of the Digital Dozen Whimsy week already and today I've gone with a much more abstract approach to the theme. The definition that google gives us for Whimsy is "playfully quaint or fanciful behaviour or humour". So while I couldn't show a behaviour on my nails, I could sure show a playful and imaginative design, which would surely fit the theme as well. This nail art was so fun to create, especially the part when you use nail polish remover on your nails to make the design magically appear. To create this look you need gel polish. I used a white gel polish base by Australian brand Gelicious. You will also need a gel top coat, again I used the Gelicious Ulta Glaze top coat. 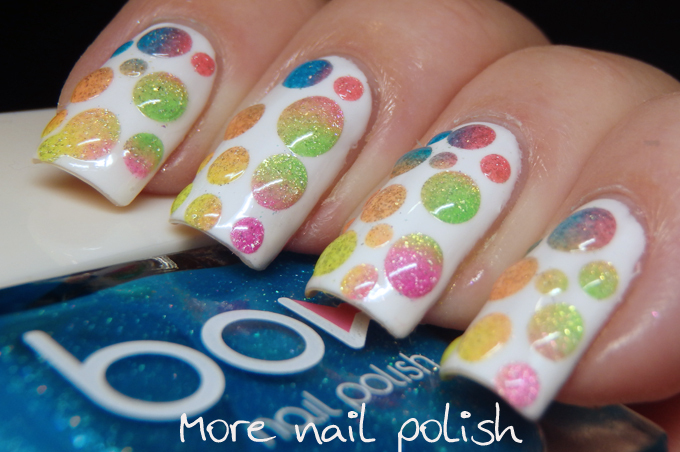 The idea is that you paint a design on your white gel base (I did a bit of neon sponging) and then you apply dots of clear gel polish. After curing it, you use polish remove to remove the polish that isn't protected by the top coat, thus making it white again between all the bubbles. 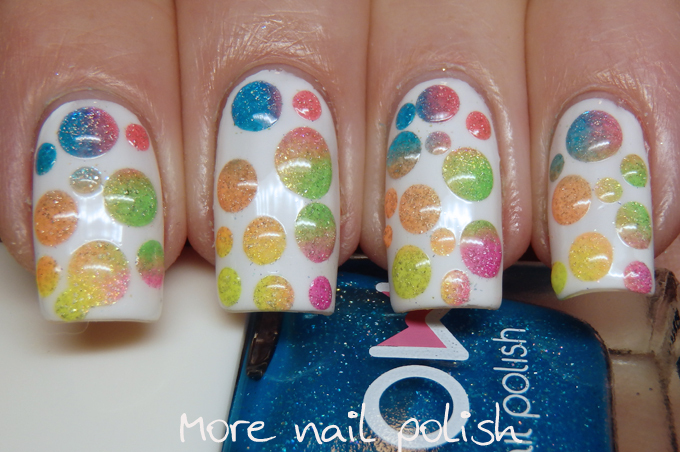 I really want to do this again with smaller dots and maybe some stamping as well as a gradient beneath the bubbles. 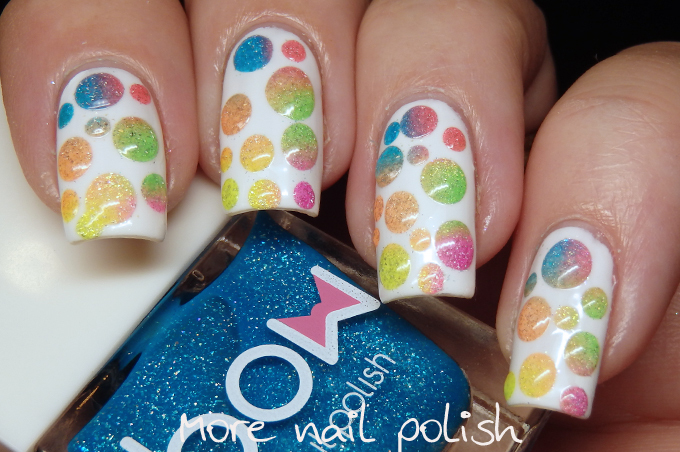 I also want to try it with darker shades like a black base and then multichrome bubbles. Oooohhh so many designs to try and only ten little finger! I'm just off to finish editing my video for this, so make sure you jump over to instagram and check it out. Ahhh, i like this. Very cool! Also, Gelicious may be an Aussie 'owned' brand but they have all their gels made in China. This ticks me off because their advertising leads you to beleive they're Aussie made when they're not. These are so neat!! I can't wait to see what you come up with once you experiment with this technique more. 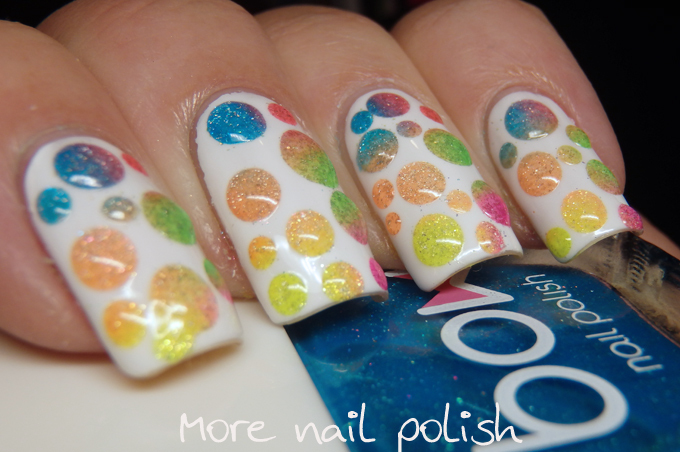 The stamping underneath the bubbles sounds like it could be really cool!